Critical opinion has settled pretty solidly on the “best” films of the cinematically prolific 1940s; look at ten lists and you’ll see a lot of overlap. The second World War was, of course, a heavy thread through the first half of the decade, providing fodder for stories on the one hand and on the other, a desire for the escapist balm of comedies and musicals. The 1940s saw the emergence of the auteur, filmmaking led by the director as opposed to the writer. Charlie Chaplin, Orson Welles, Howard Hawks and Alfred Hitchcock were doing some of their best work. The 1940s saw the rise of Technicolor but also of film noir with its dark, cynical, moody and fatalistic stories of hard-boiled detectives and treacherous women. At the same time, screwball comedies proliferated. This was the decade of Hepburn and Tracy, Bogart and Bacall, of nostalgia and neo-realism, star-crossed lovers and double-crossing villains. To a large extent, “best” is a meaninglessly subjective term. We love what we love, and for some of us it’s romantic comedies and for others it’s monster movies, while for others it’s about this cinematic innovation or that groundbreaking foray into previously unexplored subject matter. We distilled our list based on a little bit of each of those things, but overall, it’s a suggestion of required viewing material for anyone who aspires to cultural literacy. Also, we just think these are some damned fine films. Wolf Man Larry Talbot, along with Frankenstein’s Monster, represents the more sympathetic side of the Universal monster movie canon, although some viewers would doubtlessly substitute the word “whiny” in its place. Regardless, poor Larry never asked to turn into a werewolf, and he spends most of the sequels trying to figure out a way not only to be cured, but to kill himself and end his long suffering in the process. The 1941 original remains the best and most earnest film in the series—a portrait of a man who has no power over the raging beast within. It’s the film that made Lon Chaney Jr. a household name on par with his father, throwing him into the same career of genre films as the famed “Man of a Thousand Faces” during the silent film era. Famed for the groundbreaking FX of its iconic transformation scene, and aided by the same top-notch makeup that Jack Pierce employed in Frankenstein, it raised the bar for horror FX substantially. Like other Universal horror films from the classic era of monster horror, it’s heavy on the atmosphere and old-fashioned spooky settings: Fog-wreathed graveyards, dark forests and gothic dwellings, while taking to heart some of the lessons learned by superior Frankenstein sequels such as Bride and Son of Frankenstein. Throw it on at your next Halloween party, and you’ll see that it holds up remarkably well. —J.V. The first commercial film-animated or live-action-ever to be shown in stereophonic sound. A collection of eight short pieces intercut with live-action intros by Deems Taylor, Fantasia is set to classical music conducted by Leopold Stokowski, mostly with the Philadelphia Orchestra. While the origin of the film’s concept was fairly mundane (Disney wanted a star vehicle for Mickey Mouse, whose ratings were flagging). What ended up happening, though, was a really interesting investigation into how music could be represented visually in the animated medium. Rather than writing storyboards and creating a soundtrack, the production team sat in meetings listening to Paganini and Stravinsky and Mussorgsky until Disney connected the sounds with images and built on it from there. Disney, who wasn’t much of a classical music buff, found his famously boundless curiosity piqued by the concept of using animation to support music rather than the other way around, and plunged into the project with enthusiasm, believing it would open people’s ears (like his own) to classical music they had previously ignored. An amazing collection of experts and performers were assembled to consult on science, animal movement and different types of dance. (Disney scrapped a portion of the Rite of Spring sequence that showed the discovery of fire out of concern that it would provoke angry Creationists; but biologists, paleontologists and astronomers, for example, were consulted.) Similarly, animators were given tickets to the Ballet Russe, and reptiles were brought into the studio to be studied. Fantasia ran at New York’s Broadway Theatre for 49 consecutive weeks, the longest film run ever at the time. Shows sold out across the country, yet Fantasia initially ran at a loss due to the expense of the state-of-the-art Fantasound systems along with theater lease and other production costs. RKO cut the film from two hours, five minutes to one hour, twenty minutes and showed it in mono to trim costs. It was restored partially in 1946 and to its original condition in 1990. Weird, beautiful, orgiastic, abstracted, wildly colored and meticulously recorded, the film was a critical darling and considered to be an incredibly bold move on Disney’s part, though many in the classical music community nitpicked Stokowski’s arrangements. (Everyone’s a critic.) Overall, the film is more a distance runner than a sprinter and a brilliant example of Disney’s strange, maverick, expansive imagination. —A.G. As is the case with many films of the 1940s, especially those foreign selections made or released in the shadow of World War II occupation—by the Axis or otherwise (see also: Kurosawa’s navigation of American censors during the U.S.’s squatting in Japan)—Le Corbeau is a morally thorny tale, infatuated more with the indelible darkness of all human beings than in exploring any sense of hope that the world need not be a crappy place. Director Henri-Georges Clouzot treats as a given that the world is a crappy place, through and through, detailing how the denizens of a small French town (“anywhere”) are pitted against one another through a series of “poison pen” letters sent by the titular Raven. 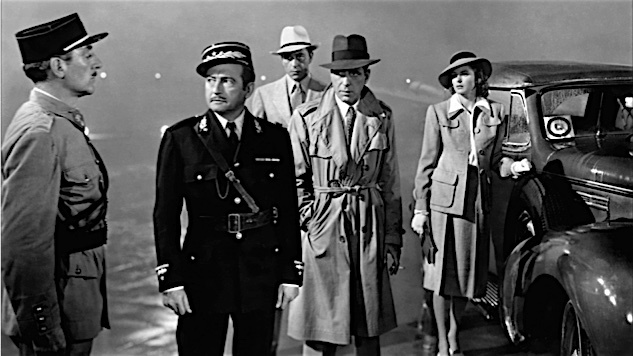 Everyone, it seems, has something devastating to hide, not the least of whom is Dr. Germain (Pierre Fresnay), a man known for his lusty dalliances, which feels ironic given that he also conducts illegal abortions in the area. As the letters pile up and one cancer patient (Roger Blin) commits suicide (due to a letter from the Raven informing him that his cancer is terminal), the town grows increasingly desperate to find the culprit, sparking a witch hunt that catches Dr. Germain in the midst of his many lies. While his plot is the stuff of soap opera pulp, Clouzot masterfully mounts paranoia on top of tension on top of existential guilt, winding his players so tightly that when the film inevitably erupts into violence, the viewer is left with nothing but a bleak sense that nobody ever gets what they deserve. —D.S. one of those star-crossed love stories that, if it doesn’t tug at your heart, you might want to check to make sure you have one. Joan Fontaine plays a young woman in 1900 Vienna who falls in love with a concert pianist. Stefan, the pianist (Louis Jourdan) is remarkably clueless, and, reading the letter as he’s preparing to leave town to evade a duel, follows Lisa through a series of flashbacks starting when she was 14, progressing through an episode where they’d had a brief tryst, to her marrying someone else and giving birth to Stefan’s child, to him trying to seduce her at a chance encounter without realizing she was the same woman, to their child’s death from typhus, which is threatening to carry her off as she writes the letter. A paean to the ungodly power of unrequited love, a gut-wrenching treatise on self-centeredness, and in the deft hands of Max Ophüls, more contemplative and penetrating than melodramatic. Seriously, if this doesn’t bring tears to your eyes, see your opthalmologist. —A.G. A film stuck in time, place and temperament, Miracle on 34th Street is one of the two heavy favorites, along ith It’s a Wonderful Life, in the battle for the title of “greatest Christmas movie ever,”. Your preference will come down to how well you like your schmaltz: Those with a taste for unadulterated sentimentality will likely lean more toward Capra, while those who like a healthy sprinkle of cynical realism on their holiday fare will probably go for George Seaton’s Miracle instead. Not that it’s completely cynical, mind, but it is a surprisingly frank and thoroughly practical demonstration of the stress Christmas customs—particularly shopping—visit upon us year in and year out. By showing its audience the positive side of capitalism in action, the film reminds us of its negative side, too, posturing about Christmas’s true meaning and capturing New York City at the peak of its bustling consumerist culture. That makes Miracle on 34th Street sound both drier and jaded than it actually is, of course, and more than 70 years on, it’s still one of the most effectively hokey pieces of holiday entertainment the industry has ever produced. —A.C.